There are many different investment strategies out there, and one of the lesser-known strategies is momentum investing. While momentum investing is often denounced as an unreliable and risky way to grow portfolio returns, this investment strategy still has its fair share of returns and rewards. Even though it isn’t the first-preferred investment strategy for investors, it can be beneficial to know what momentum investing is, how it can help, and how to use the strategy effectively. In this blog, we are going to cover what you need to know about momentum investing as well as multiple ways to use the strategy effectively and efficiently. Momentum investing is an investment strategy that aims to capitalize on the continuance of existing market trends. 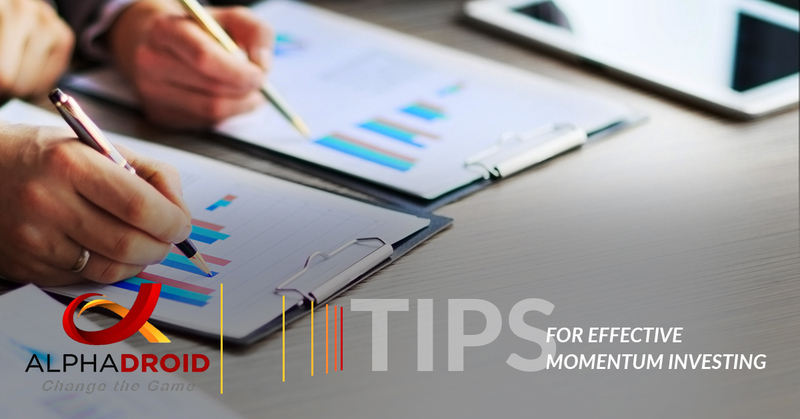 While momentum investing is similar to other common investment strategies investors generally avoid viewing valuation markers, such as annual growth reports. Instead, with momentum investing, investors utilize a variety of tools to calculate the direction a stock is fluctuating for periods that can range from several days to several weeks. Using the calculated information, investors attempt to predict if stocks will continue to grow or fall in price. In addition to these charting tools, investors heavily rely on consumer views and opinions to make their trading decisions. Compared to traditional investing strategies, momentum investing generally has a shorter duration of trades. For many professional investors, the shorter duration of trades may influence multiple trades for the same stock various times through the day, especially during periods that often tend to be busier. Even though momentum investing has proven to be successful, there are few investors that solely trade on momentum. While it may seem simple, momentum investing certainly is not easy. This is due to main reasons — such as the presence of a high turnover rate and a high-cost strategy. Capital gains taxes, spreads, and commissions can drag on market performance while annual turnover often exceeds 100 percent. This style of investing also takes ruthless patience and discipline that only a few investors can handle consistently. However, even with all the challenges of momentum investing, it is still the most successful investment strategy that offers the un-avoidable offer of large gains over short periods of time, something all stock market investors desire. With the challenges and risks of momentum investing, many investors are hesitant to trade on momentum. However, by following the tips below, investors can effectively utilize momentum investing to obtain significant gains. 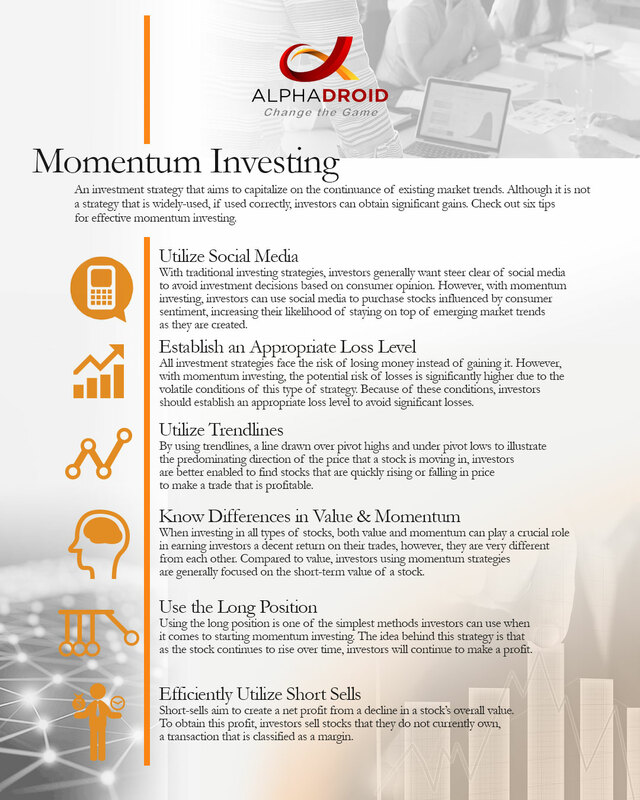 Social media can be one of the most powerful tools investors use when implementing a momentum investing strategy. With traditional investing and investment strategies, investors generally want to steer clear of social media to avoid investment decisions based on consumer opinion. This is because consumer sentiments can quickly alter, potentially eliminating any gains investors may have made with a trade. In contrast, it is the exact opposite is done with momentum investing. The idea of this strategy is to attempt to purchase stocks based on the options of consumers. With the diversification of social platforms and news sources, investors can help increase the probability of staying on top of emerging market trends as they are created. Just as investors would with traditional investment strategies, it is essential for investors set an appropriate loss level to avoid detrimental damages. All investment strategies face the risk of losing money instead of gaining it. However, with momentum investing, the potential risk of losses is significantly higher due to the volatile conditions of this type of strategy. The exact loss levels will differ from investor to investor. The range is usually based on their financial situation as well as the period of the loss. In order to establish an appropriate loss level, investors must ensure that they only invest what they are comfortable with losing. In addition, to avoid damaging losses, investors should make sure that they can quickly regain their investments after they are lost. There are a variety of reports that investors can use with momentum investing, however, with momentum investing the most common report used by investors is a trendline. In short, a trendline is a line drawn over pivot highs and under pivot lows to illustrate the predominating direction of the price that a stock is moving in. By using these indicators, investors are better enabled to find stocks that are quickly rising or falling in price to make a trade that is profitable. The exact date range for trendlines can carry, however, most investors choose to use reports that focus on much shorter periods of time ranging from a few days to a few weeks, at most. When investing in all types of stocks, both value and momentum can play a crucial role in earning investors a decent return on their trades. These two terms, however, are very much different. The two, both momentum and value, cannot be used conversely when implementing a momentum investing strategy. With momentum, investors are generally more focused on the quicker return that a stock may offer. Goals should always be short-term and investors should frequently adjust the strategy to recompense for changes in the investment environment. On the other hand, with value investors are generally more focused on the long-term value of a stock. Value-based decisions can be impacted by factors, such as earnings statements, trading volume, and PE ratios. Using the long position is one of the simplest methods investors can use when it comes to starting momentum investing. A long position is the purchasing of a security, such as a bond, stock, or commodity with the expectation that the asset will increase in value. Generally, investors who have long position investments have no plan to sell the security in the near future. The idea behind this strategy is that as the stock continues to rise over time, investors will continue to make a profit. Those who carry out momentum investing will generally have a short holding period than other investors would. For example, a momentum investor may choose to only keep a stock for multiple days to multiple weeks before choosing to sell it and move on to a more profitable trade. The use of short-sells is what separates experienced momentum investors from the inexperienced ones. Different from long position trading, short-sells aim to create a net profit from a decline in a stock’s overall value. To obtain this profit, investors sell stocks that they do not currently own, a transaction that is classified as a margin. Compared to traditional trading options, these transactions are under much stricter requirements. Just like any investment strategy used, it is essential for investors to understand the risks and rewards before implementing it into their practice. Investors that use momentum investing will have the opportunity to make money from stocks that are experiencing high gains as well as loses. While momentum investing can be challenging, using an elite investment portfolio management software, like AlphaDroid, can help better illustrate the risks and returns of investing. AlphaDroid uses sector momentum measurements to help investors identify which portions of the market are likely to outperform near-term. And, with algorithmic trading strategies and Modern Portfolio Theory, advisors can better analyze, construct, and compare their investment portfolios. AlphaDroid reduces the challenges associated with momentum investing and gives investors a clearer picture of market trends and forecasts. Want to experience how AlphaDroid can simplify momentum investing and the financial advising process? Try a free trial 30-day trial today!